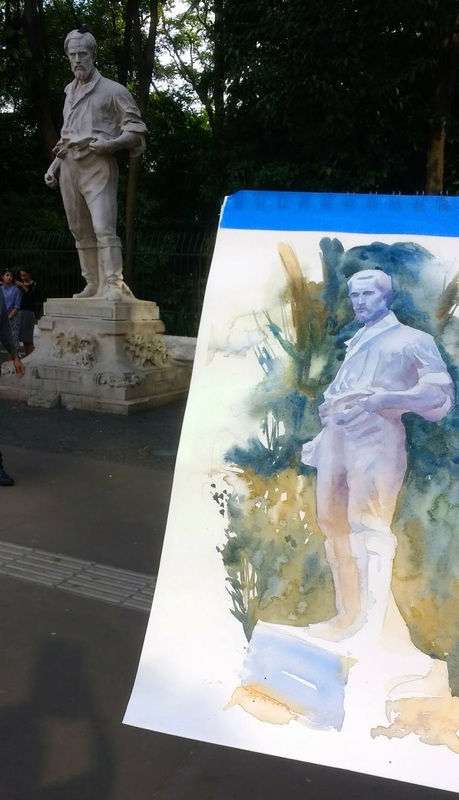 A few weeks ago, I announced the "Paint a Monument Challenge," inviting you to sketch an outdoor sculpted statue or monument. Many of you faced challenging conditions — including 15 degree Fahrenheit temperatures with blobs of snow landing on the sketchbook! A stylish and expressive solution that's in keeping with the subject. "The subject matter is not exactly what you would call a monument in that it is not a single sculpture erected in a public space in order to commemorate an event or a person. Rather, it is one from a pair of statues sitting at the entrance of a famous shintō shrine in Kyoto, Kitano Tenman-gū. (As a side note, I was actually married in Kitano Tenman-gū.) 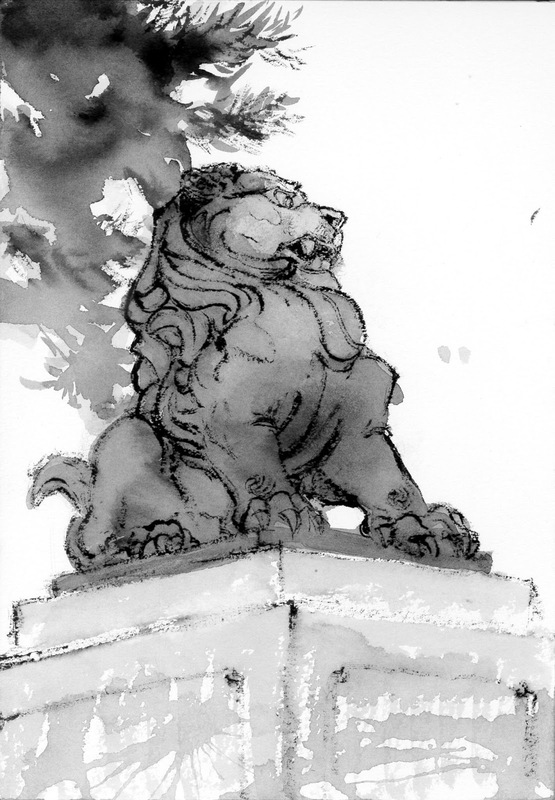 Such pairs of statues, representing two semi-fantastic creatures, the shishi, or lion, and the koma-inu, or ‘Korean dog’, are found in every shrine throughout Japan, and are thought of as guardian protectors, usually situated at any threshold outside and inside the shrine." "What is striking with this particular pair is how ‘untraditional’ it is. Traditional lion and dog pairs are usually smaller than human-size, carved out of stone or wood, and retain a more traditional appearance. 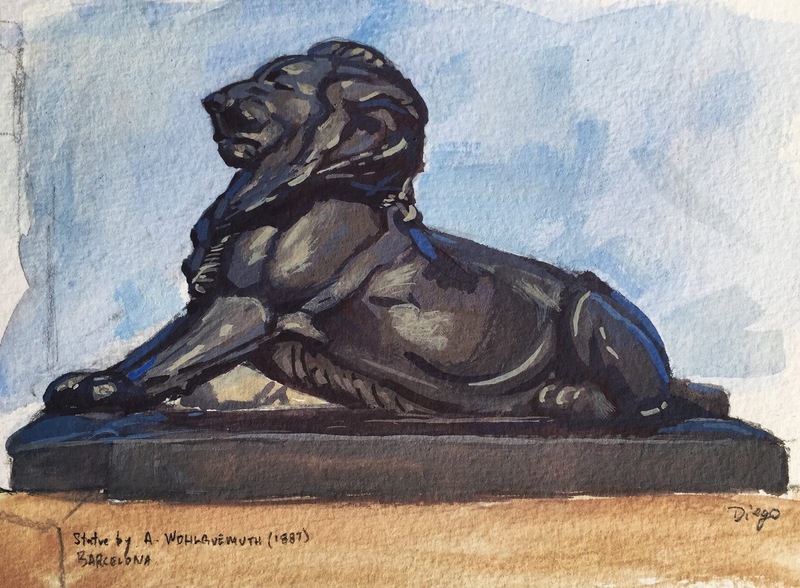 Here, both statues are made out of bronze; at a huge scale; and while the shishi is thought to have derived from actual lions, its traditional iconography was handed down from Chinese models, as an actual lion was never seen in Japan before the 19th century. Here, it seems that the traditional shishi was fused with western examples of lion monuments." 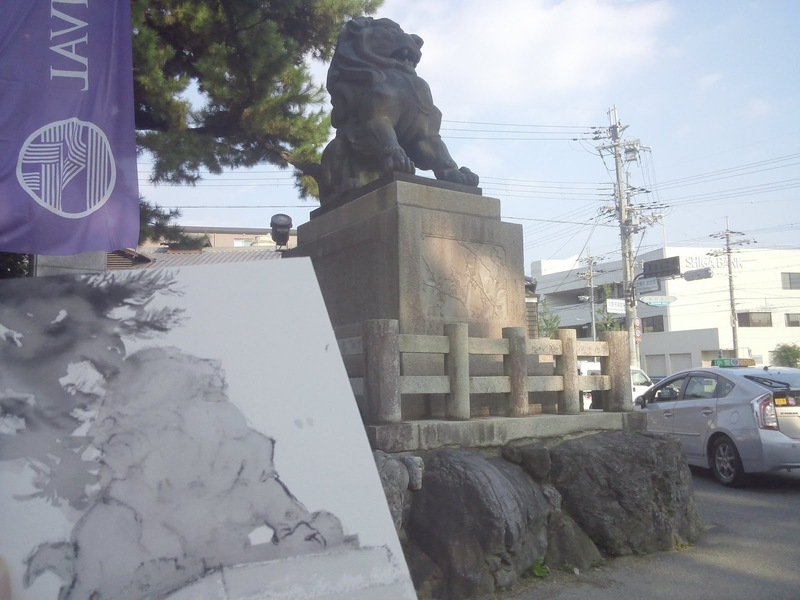 "My sketching tool is a yatate, a portable inkwell filled with sumi ink ground on an ink stone, and paired with a calligraphy-style brush that is kept in the handle. This tool was used as far back as the 15th century, but nowadays yatate are generally thought of as antiques more than anything else. They still offer one of the most compact sketching kits imaginable, and allow to safely carry an expensive brush that would normally not leave the house. This was only my second attempt at sketching using a yatate and I cannot say that I took advantage of the versatility and expressive potential of the Japanese brush and ink." 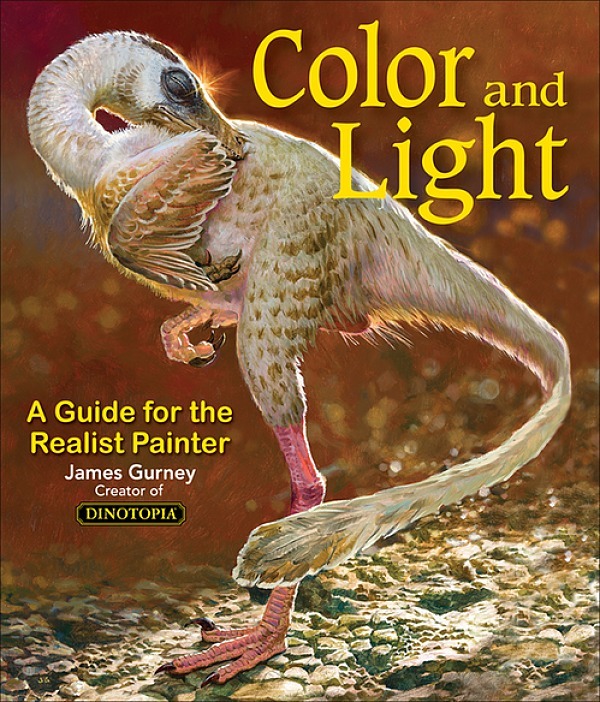 Superb handling of light and interesting color gradation between warm and cool. I like the way he bleached out the lights. I also admire the variety of the edge around the vignette. "For my entry, I picked this statue in front of Trianon Park in São Paulo, Brazil. I walk by it almost everyday and there is always an appealing light striking it in the afternoon. My medium of choice was watercolors which I find the fastest to work with. I thought it would be interesting to work with the cool and warm shades, which is always a tricky thing to do because I wanted to avoid muddy colors (my previous attempt was a mess D: ). The hot pressed paper won't allow much margin for error so worked on those lights in a single layer, from the blue hues at the top." "The challenge was a great excuse to paint this subject and it was a lot of fun. I look forward to the next ones!" Carefully observed forms and textures, with a sense of setting and time of year. 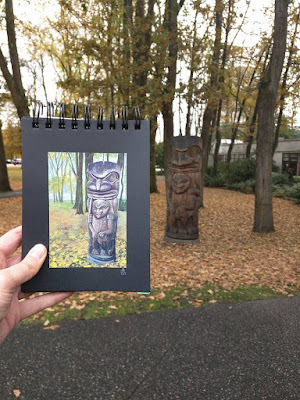 "For my monument painting challenge, I've picked a wooden totem sculpture outside the Richmond Art Centre in Richmond BC. I used gouache paints and synthetic brushes on 7x5" black 80lb acid free cover stock." "I really enjoyed this painting, as it was interesting to notice how from top to bottom the tones of the wood became more cold, since the bottom of the sculpture is more exposed to moisture." What a sad story, and at the same time, what a tribute to the devotion of the parents. 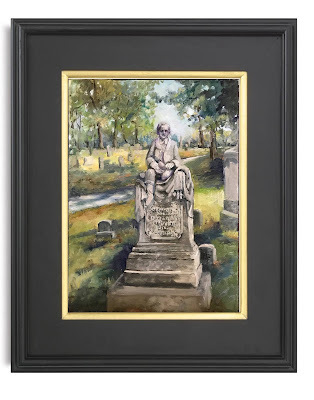 "Here is a painting I did of the George Blount Memorial. It is a headstone of a five year old boy that died falling from a second floor bannister in his parents hotel in 1876. His parents, a prominent family in Columbus, were devastated by the loss of their son and created this monument in his likeness." 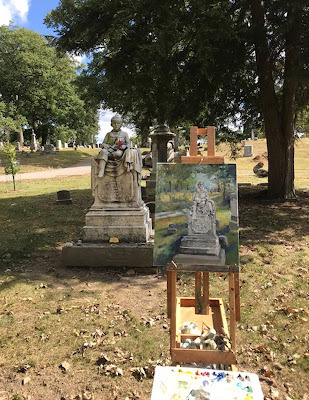 "It is located in the Greenlawn Cemetery in Columbus, Ohio and "Georgie" has become a popular fixture in this park-like cemetery." 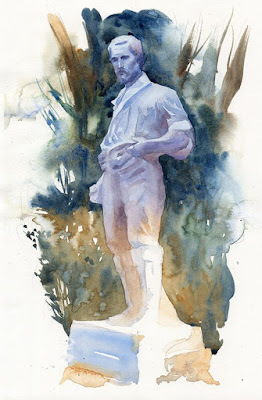 The watercolor and gouache technique gives you a good range of descriptive options for the bronze and marble. 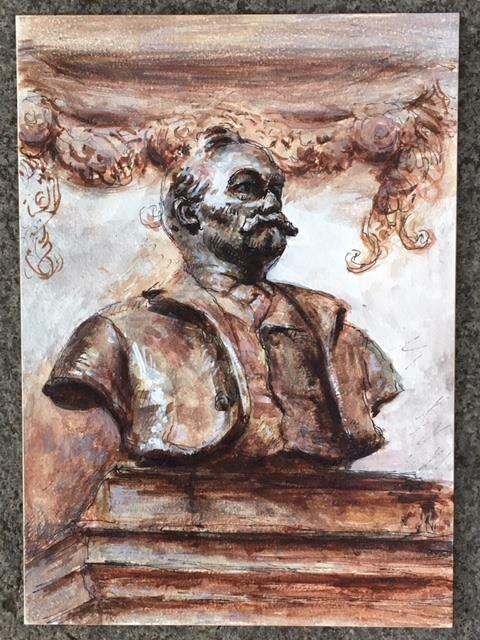 The bust seems to be a respectful tribute from one artist to another, and you've added to the chain. 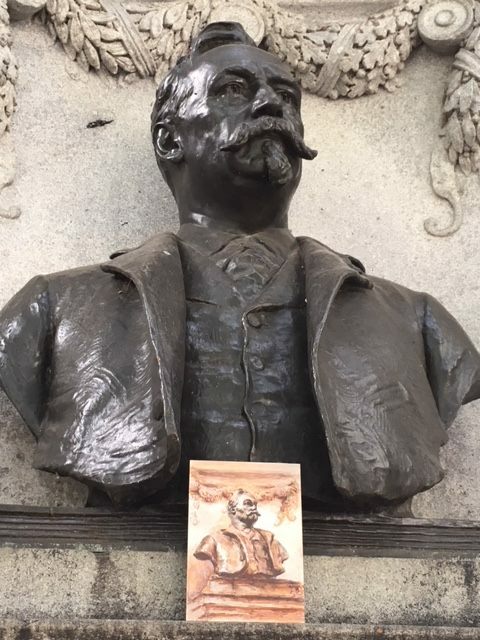 "This memorial to the artist and architect Richard Morris Hunt was designed by the sculptor Daniel Chester French. It is installed in the wall of Central Park across from the Frick Museum on 5th Ave. and 70th St. Hunt designed the facade of the Metropolitan Museum of Art. I sketched it in watercolor with white gouache." This rendering captures the weight and power of the bronze. "The stars aligned, with this challenge. 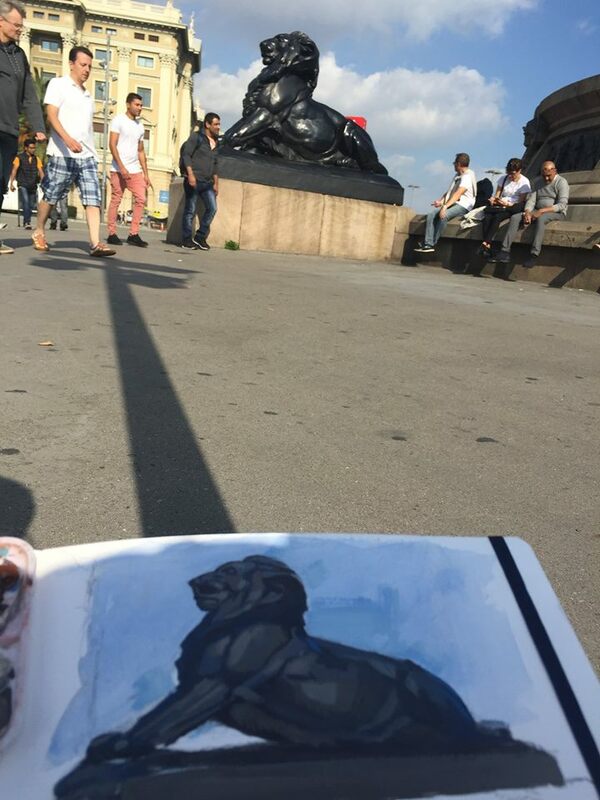 I travel to Barcelona often for work and have always wanted to paint the lion statues around the Christopher Columbus monument. It has a constant flow of tourists, and on the day after Catalonia declared their independence, I only had this beautiful, sunny Saturday. Painted in Gouache with Cobalt Blue, Burnt Sienna, a bit of Cad Yellow, and Titanium White." 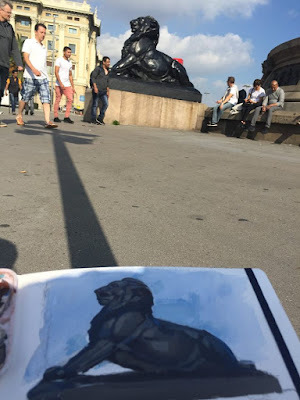 "Incidentally, it was the video of the painting Mr. Gurney made a few years ago, of the horse and rider statue, that made me decide gouache was worth a try. Thank you James for your generosity and inspiration. Best spot was on the floor with a little shade from a light post. Luckily, I never got stepped on." I love the video and the art you did, as well as the story of the way your son joined you on the adventure. "The statue I sketched for the challenge is called "The Secret" by an artist called John McKinnon. I chose this one because it is a statue I see almost every day going to the playground with my 2-year old son, he likes it a lot and he was excited to see it painted in my sketchbook :-) To make the challenge even more fun, I put together a short video (1'40") documenting the process: https://youtu.be/vEVvfkZ6Blw. I used mostly watercolour in my Moleskine watercolour sketchbook (8.25"x5") and added a touch of gouache at the end to suggest a few leaves." 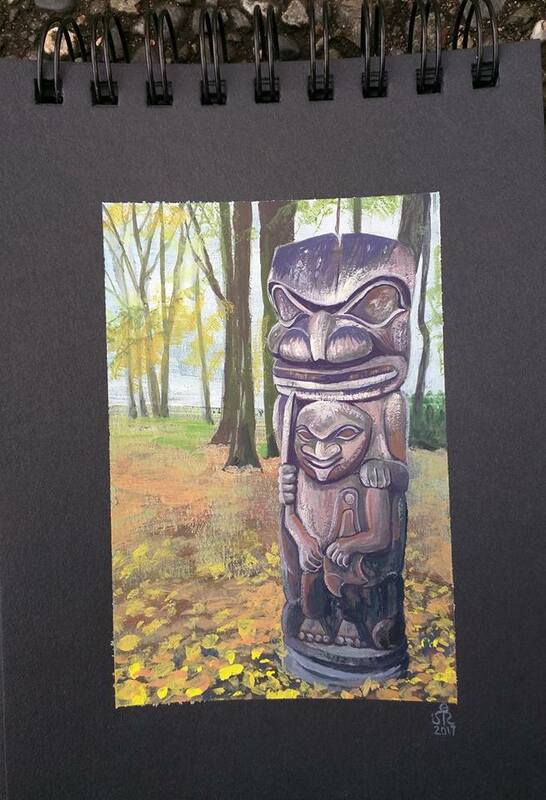 Be sure to see all the entries on the Paint a Monument Challenge page on Facebook. Thanks to all who entered. Attention Winners (and Honorable Mention), please email me your mailing address (gurneyjourney at Gmail) so that I can send you a "Department of Art" patch, and let me know what video download you want. 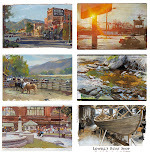 Great paintings and well deserved winners. Excellent work! A very enjoyable challenge to see and read about. Wonderful work, all -- thanks, as always, James, for showcasing such a variety of inspiring artists! I was intrigued by Matthieu Borter's use of a yatate, an article I'd not heard of, and found a fascinating write-up at http://www.stutler.cc/pens/yatate/index.html. The Malaysian artist Kiah Kean -- who gives workshops at Urban Sketchers symposia -- uses a similar technique to transport ink: he stuffs small bottles with gauze and draws with "twigs": https://docs.google.com/document/d/1cyDqlsbNHPy45Izw_VXoAHHANoNLtb9UPJ74Yi5oBHU/edit. wow some inspiring work there! Thanks for this great Challenge! Congrats to all those who entered and the finalists who did really outstanding work. Evelyn -- I had also been aware of Ch'ng KK's technique for transporting (without spilling) ink and drawing with DIY twigs from youtube -- but didn't realize there was an historical antecedent in the yatate. I find the crude and random nature of the twig takes the emphasis from the ink line and puts it back on the shape of what you are drawing--it also allows for "dry brushing". Many thanks, Daroo, for providing these links -- wonderful to watch! Yes, the rounded twig does give a nice light "dry" tone, when handled so expressively . . . .
Well done to all the winners. I enjoyed all the entries and I'm looking forward to the next challenge.